In a study from the Michigan Department of Water Quality, a test conducted in 1997 showed that ground water wells became tainted with 2,4-D and Endothall after it was applied to a lake to treat invasive vegetation. The study showed that ground water wells measured within 2 days levels that were 7 times amounts allowed by the EPA. 2,4-D persisted in measurable quantities in these wells for 8 months. The herbicides 2,4-dichlorophenoxy acetic acid (2,4-D) and 3,6-endoxohexahydrophthalic acid (endothall) are commonly applied to lakes and ponds to control nuisance aquatic plants. In 1996, a study was undertaken by the Michigan Department of Environmental Quality (MDEQ) to determine if these two aquatically applied herbicides could migrate from surface water to the ground water. The study included the application of granular 2,4-D and liquid endothall to an 11.7-acre lake, the collection of over 250 ground water samples, and the analyses of the samples for the presence of 2,4-D and endothall. Detectable levels of 2,4-D and endothall were present in the ground water 2 days after application. Levels of 2,4-D exceeded the U.S. EPA maximum contaminant level (MCL) of 70 ug/L for 54 days, peaked at 595 ug/L, and declined to non-detectable levels 202 days after application. 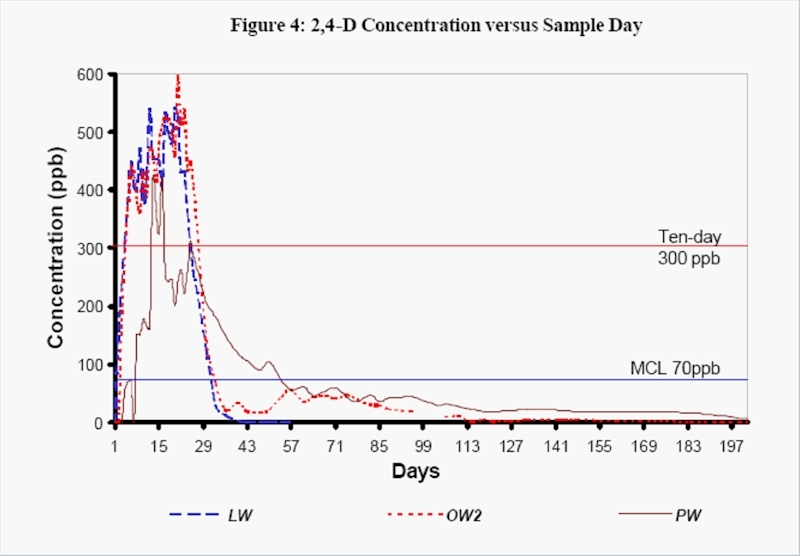 An endothall concentration in ground water greater than the MCL of 100 ug/L was observed 11 days after application. The study demonstrated that aquatically applied endothall and 2,4-D could migrate from surface water into ground water under certain hydrogeologic conditions. Further research into the controlling factors for the migration of herbicides into ground water is needed.